This hub page at the web blog "Passport to Dreams Old & New" gathers up all of this site's published content covering the topic of Disney's Pirates of the Caribbean attraction. It was last updated on June 29, 2017. Pirates of the Caribbean: Two Soundtracks - June 2017 - full attraction audio mixes for the original version of the attractions at Disneyland and Walt Disney World. Marc Davis and Pirate Gold - November 2016 - A update of "The Case For the Florida Pirates", with a new discussion on Marc's intentions on this ride and a new way of thinking about the story it tells. 2015 Year-End Report - December 2015 - covers the refurbishment of pirates and briefly discusses the impact of the 2006 movie tie-in refurbishment on the logic of the attraction. The Case for the Florida Pirates - June 2010 - On the Florida incarnation of the attraction, a case for what it got right and how it has been compromised. The "flip side" of the above article. An Aesthetic Profile of Caribbean Plaza - January 2010 - Getting into details on Caribbean Plaza, The Magic Kingdom's most deceptively complex area. Structuring the Experience - February 2009 - How arches, walls, portals and doors help make themed attractions into artistically satisfying experiences. Two by Yale Gracey - February 2008 - How two key effects for Pirates of the Caribbean were accomplished. The Long, Lonely March - August 2007 - An essay covering the narrative, tone, structural and artistic successes of Disney's original fully-themed pre-boarding queue experience at the Walt Disney World Pirates of the Caribbean. 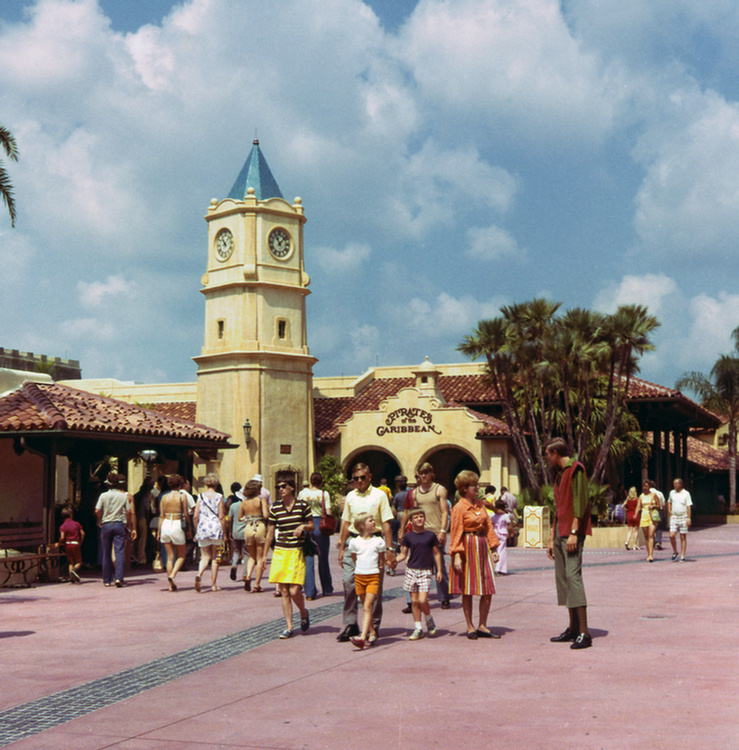 Caribbean Plaza: Romance of the Tropics - August 2006 - The first post on this blog discusses early approaches to the area and attraction which inspired it. Visual Structure in New Orleans Square - Mid 2004 / Early 2005 - Revised version of my first essay ever about themed design and the area that made me aware that theme parks could also be art. I have been looking for the answer to this question for a while and haven't had much luck, maybe you might know. In the Florida version of Pirates, as the boat passes the beach with skeletons and crabs on the left, there is some rockwork on the right. In the center of the rockwork is a square cutout containing a blue light that looks different from most of the rest of the theatrical lights in the ride. It has always seemed strange to me that the light would be directly in front of the boat before it makes the turn to the left to the drop, it feels like it is there for a reason. I know that sometimes theatrical lighting can't be as hidden as one would like, or else the stuff you are supposed to notice would be too dark, but so much of the rest of the lighting in the ride is hidden so well. Is there anything special about this light, or is this just a case of me looking the wrong way because I have been on the ride so much? Sorry to say that there's no exciting, exotic answer to your question: back in 2006 when WDI was re-lighting the ride, they decided to light up the back-left wall of the beach scene and that is how they decided to do it. They also added a very obvious light to the "Hurricane Lagoon" scene around the corner that guests face directly as they approach. Not so good. Do you by any chance know where it comes from/what it's called? It's been leaving me so puzzled for the longest time now and I've been wanting to find out. Thanks! What you're hearing has no real name, I've always called it the "Spanish guitar". It plays in two areas of the queue: the courtyard room before the load area and also from one of the cells inside the dungeon. As far as I know it's still there, just currently inaudible. I recorded the entire thing back when I worked at Pirates, you can hear it in the Caribbean Plaza track of my "Musical Souvenir of WDW" project, linked on this site on the right. I've never actually figured out if it's a real tune. Not that I've tried, mind you, it just never occurred to me. It always struck me as random noodling about on a guitar, sort of the East Coast equivalent of the banjo music from Disneyland's Pirates. Perhaps my recording will help you identify the tracks! Moonlight Bay is indeed still there. I looked through a few videos online and didn't see it either.... it's almost impossible to take a good photo of, must be next to impossible to take a video of! Just want to say thanks for this blog and for posting the Spanish guitar music. I spent a lot of time at Disneyworld as a kid and it brought back a lot of memories.